Our Hog Roast, Hot Roast Joints and BBQ service is available throughout the year. This alternative to finger food buffets and formal seated meals provides your guests with a focal point which is both visual and very appetising. It’s ideal for Wedding celebrations, parties, fetes or any other outdoor event in Shropshire or beyond. 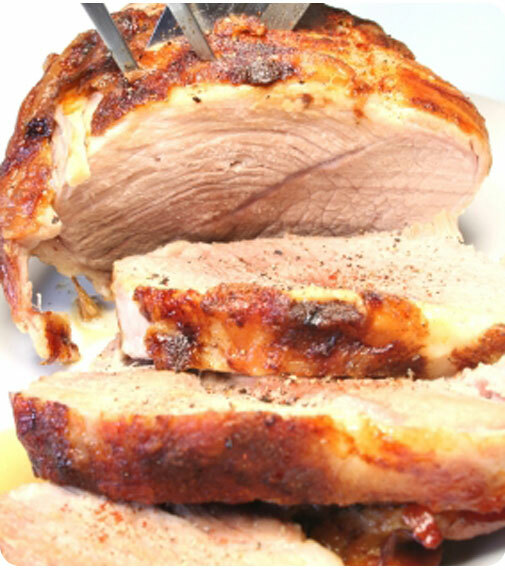 Imagine the succulent smell of Hot Roast Pork , Beef or Lamb wafting through your event or Burgers and Sausages sizzling on the barbeque, whilst you are safe in the knowledge that all is being taken care of by our experienced team. Just wanted to say that the BBQ was absolutely delicious and the catering team highly professional. Many thanks for providing such an excellent service. No we are not happy with Saturday we are absolutely delighted!!!!! Everyone on e commented on how delicious the food was and how professional the staff were. Absolutely fabulous!! Staff were helpful, excellent! Hi Anne –Marie – you were brilliant. Thank you. It was absolutely perfect. I didn’t even notice you packing up and leaving!!! Really fast and seamless set up and service. Happy and friendly staff. Lovely food. Would definitely recommend and use you again. Just wanted to say an enormous thank you to all of you and the rest of your staff, in front and behind the scene, for the wonderful job you did on Saturday and Sunday! We all had the most amazing time made all the better by the amazing food you laid on for us. Everyone commented on the quality of the food and the efficiency of the staff, thank you. We will be recommending you all when ever we can and hope that we will be asking you to help us out again in the future. We just wanted to send our thanks for our amazing hog roast! Everything was served exactly on time and had many compliments from our guests. On behalf of the Wyre Forest U3A I want to say a very big thank you for all your work in providing us with such a super spread on Tuesday at the Engine House. Everyone was most complimentary about the food and one lady who had the vegetarian sausage said that it was the best she has ever tasted and wondered where you got them from!! The ladies who served us were superb too – it was service with a smile. Hi Just a quick thank you, for the catering you did for Lucys 21st party on Saturday night, your staff where brilliant, very helpful, the food was fantastic with all my guests complimenting the food, thank you for helping to make the party a great success. Please thank the two ladies who came. I would recommend your company and definitely use again. Hi, The girls were great on the night and couldn't have been more helpful. Really good service and would definite use again. Just a quick message to say thank you so much for all the hard work of your team. They did us proud and made guests feel incredibly welcome. The food and bar was fantastic. We will highly recommend you to all our friends and family. The event was great and the two ladies who came out to the party were superb. Everything tasted fab and they were more than helpful at sorting out the left overs. Everyone commented how great it was so thanks to you and the team for helping out with the catering. Thank you for doing the hog roast at little Wenlock village hall on the 15/8/2015 everything went really well & the roast and the salad was very nice . Staff really friendly except Daz ( joke ) . I would use your company again thank you . Just wanted to say thank you to yourselves for providing such excellent service to us. Ann Marie and Karen have been so helpful on the phone, sorting the arrangements and the girls that worked on Saturday night were brilliant. All of our guests have commented on how lovely the food was. I would like to say a massive thank you for fantastic buffet and hog roast you provided for our wedding 27th June 2015. The food was amazing, everyone of our guests commented on how wonderful it was and what a wonderful day we all had. Just wanted to pass on my thanks and complete gratitude to you and the staff you had attend our event Saturday, all so proffesional and helpful!! Nothing was too much trouble and the food was amazing!! We will definatley be using your services again!! A little belated but I just wanted to say a big thank you to you and your team for last Saturday evening, the food was delicious and your team did a great job on the night! Just wanted to say how great the roast was yesterday. Karen and Sue were brilliant, the food was delicious and everyone was stuffed  (in the very best way)! I just wanted to say a massive thank you for the last 2 Thursdays. Both evenings were a massive success and the food was excellent. The guests from Decathon had a fabulous time and you and Hammonds were a big part of that. Please can you thank everyone involved for us! I would like to say a huge thank you to the staff who came to cater for my dads 60th birthday party in Broseley last night. The food was great quality and went down brilliantly with the guests. The staff were extremely pleasant and professional and we couldn’t have asked for more. Thank you to you all!! We had a wonderful day, all the staff - catering and bar – were friendly and helpful. They worked very hard but always with a smile on their faces. The gentleman working at the bar made sure the groom always had an ale in hand (which he needed for courage when it came to the speeches and first dance), I thought that was a really nice touch. The food was lovely too, I especially enjoyed the lovely salads. Thank you so much for the excellent job you did for us this weekend. Your staff were brilliant - really professional, and the food was perfect. I got so much good feedback from our punters and I'm delighted we chose your outfit. If we manage to pull the whole thing together next year we'll 100% be using you again. Just a quick message to let you know how pleased we were with everything last Saturday. The food was perfect; flavours' just as I had hoped for, served hot and plenty to go around with lots of positive comments from guests. Ann Marie and her team were very helpful and attentive to our guests. So, all in all, a very happy customer! A quick line to say THANK YOU for the great catering at our party on Saturday. The food was the best we’ve ever had and there was lots of very positive feedback. The team worked very hard but made it look effortless and were a delight to have around. Look forward to our next one. Just a quick email to you to thank you for adding to our perfect wedding. The food was brilliant, although I didn’t have too much because I was too busy dancing! Everyone commented on the great food. The salmon for aunty Jen was appreciated. Darren was great and I don’t know the name of the girl behind the bar but she was lovely, chatting with my friends and family. Can you pass on our appreciation to your fantastic staff, please include your chef in that, we can’t have the kitchen left out!!! I would highly recommend both the barbecue and the mobile bar. The food was excellent and catered for different needs such as vegetarian and gluten free without any problems. The bar was really well stocked with reasonable prices - so glad we had it. The staff were really friendly and hard working. They arrived early, set up independently and packed away again at the end with absolutely no hassle for us - even when there was a huge thunderstorm! Hammonds were also a pleasure to deal with during the organisation beforehand - prompt. professional and thorough. We had a brilliant night! I just wanted to send a quick email to say how fabulous the hog roast and Karen and Sydney were last Saturday!! We were absolutely thrilled with everything you did and how well it went. Karen and Sydney worked really hard and were really lovely and helpful. A lot of our guests commented on how lovely they were. The food was fantastic and I cannot praise you enough. Several people took your fliers to recommend you and use you again!! From booking to serving you were efficient and helpful and I want to thank you so much for making the day so special. success and gave him a day to be remembered. Thank you again and I shall not hesitate to recommend your services. It was fantastic! Thank you very much for all your help. The food went down really well and was timed brilliantly. Many thanks for our dinner BBQ on Friday. It was perfect for our event and everything went down very well. All went very smoothly which meant one less headache for me! Karen and your/her staff were just amazing, their ‘amazingness’ was only beaten by the quality of the food you provided. We have had a vast number of people comment on the food and nobody complained, there was something for everyone, the sweet potato salad was a huge hit. My bride and I just thought it was perfect. The evening trio of meats was basically devoured and, again, everybody loved it. I went looking for some but it was all gone lol. Can you please pass on our gratitude to Karen and the team for such a wonderful service, especially the lovely young lady who with one jokey comment had the best man tripping over boxes whilst carrying bouquets in for the thank you gifts, it was so funny. I hope I don’t need your wedding barbecue service again but I do hope that I can be at a wedding where you do the catering and for other parties I plan I will be requesting your services. We just wanted to thank you for Saturday night’s barbecue. We were very impressed both by the quality of the food and the efficiency of the staff. There were lots of compliments, with the vegetarians particularly saying how nice it was to be catered for and how good the food was. We will certainly keep you in mind for any future events. We just want to say thank you to your team for an amazing day on Sunday. Everyone loved the food. Can you personally thank polly to as well, everything went really well we were really happy. I just wanted to thank you for the wonderful food that you provided for our wedding reception. Everyone commented on the high quality and variety. Please pass on our appreciation to your team for all their hard work that made our special day so perfect. All went very well, thank you. The hog roast was very good and staff left unused meat packed neatly and everything clean. Just wanted to say a massive thank you for the catering provided at Andy's birthday party. Everyone commented on how good it was and I couldn't believe the amount of food we had! Great service great food which all added to a great party. We found Hammonds by searching wedding BBQs on the Internet, it's always nerve wrecking booking something like a BBQ because you don't always get to try the food prior to the wedding like you do with a hotel. From day one Hammonds were very helpful answering all questions and making us feel very confident they had complete control and knew exactly what we wanted on the day! On the lead up to the wedding they were very attentive and nothing was too much trouble. On the day itself the staff were amazing, working in restaurants all my life I know the sign of good staff is when you don't really notice them doing their job because it's seamless and that's how the day was! Food was served promptly and tasted amazing, plates and glasses were constantly cleared and everyone complimented on how smoothly it all ran. Sally, John, Karen and Darren were a pleasure to deal with and we would highly recommend Hammonds to anyone looking to book for a wedding or any other event. I was going to email Sally later and ask her to pass on a huge thank you to all you guys that came Saturday night. It was absolutely fantastic! Everyone commented on how nice the food was, how lovely the ladies serving were and what a nice change it was to have hot food instead of curly sandwiches! From our point of view it was refreshing to not have to worry about setting up, serving or clearing down any food. The piece of mind was priceless. I'll certainly be recommending your services and I know many of my work colleagues took your business cards. Really can't thank you and Sally enough. From planning menus, communication, overcoming obstacles and the food, all fantastic!! and very much appreciated. Hi Sally, Sorry it's taken me an eternity to email you. I wanted to thank you and all your staff for the great job they did at our wedding! The canapes were sublime, everyone commented, it wasn't just the taste but the way they were displayed in the marquee, it was beautiful. And then there was the BBQ, people raved about the meats, salads and don't get me started on the bread ... it was a massive success! Thank you all so much for making my vision a reality!! RAF Shawbury Officers’ Mess Committee would like to thank Hammonds for the great service provided for our summer ball, catering for over 550 guests. Leading up to the event, the team could not have been more helpful and worked hard to tie in with our theme. On the evening their professional staff were full of enthusiasm and really added to the atmosphere of our event and the food, of course, was great! I am writing to give you our sincere thanks for looking after us so well yesterday for the Ministers retirement fun day. Everything ran smoothly and we were blessed with the weather. Your team were fantastic, lovely polite and helpful, the food was fantastic. Lots and lots of lovely compliments for the scrumptious food. Thank you so much and please pass our thanks to your wonderful team. Please can you pass on my thanks to your team for yesterday - they were superb. Thank you so much for catering at our wedding at Shooters Hill (12.09.15). We had a fantastic day and received numerous compliments from our guests about how good the food was. Your service leading up to the wedding and on the day itself was superb and very professional. The day was wonderful, the catering was fantastic, food was good, the staff were professional. Having catering was the best decision as it meant that no one had to do all the work. There was no clearing away. Overall the day was fantastic and the catering enhanced it. I would definitely recommend you to any friends. 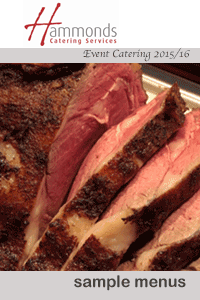 We have used Hammonds Catering on numerous occasions following our Town Hall Meetings. They always arrive on time and are ready to serve as soon as we have finished. The staff need no supervision and are always pleasant. This time we had the Trio of Christmas Meats which staff said was the best meats we had had. Well done to everyone at Hammonds. Wishing you all a Merry Christmas and looking forward to working with you again in 2019. We would both like to thank you, Darren and the rest of the team for such great work at the wedding. The service was absolutely superb with people commenting on how friendly and professional the catering team were. The amazing day that we both had would not have been possible without all the hard work of you and your team. We can not thank you enough…and I haven’t even started talking about the food yet!! All of the food was AMAZING and enjoyed by all of the guests, our only regret is that we couldn’t eat more of the canapes & BBQ due to nerves about speeches, too many guests to talk to and a dress that would have been unforgiving after a large meal, haha!! But we did go nuts for the hog roast later in the evening, which sustained us through to the early hours! If we were planning the day again we would have no hesitation to use Hammonds catering, but as neither of us is planning on getting married again, even after nearly two weeks of being Mr & Mrs, I will be recommending your services to everyone. Please forward our thanks to all that were part of the day! Thank you so much, your staff and food were amazing yesterday. And you were all so helpful for our PKU sufferer. Honestly the food was beautiful and there was plenty of it! The chocolate brownie especially got rave reviews from our guests. Both staff were lovely and worked so hard we are truly impressed! and professional with all enquirers and emails and information. The ladies who came on Friday were excellent. The food was delicious. All in all a wonderful service. We have had so many compliments regarding the food. great service really made it. I just wanted to email to say – Thank you so much for the food/service yesterday at our open day. Everyone was very complimentary about the food and the professionalism of your staff. I would like to take this opportunity to thank you and your staff for a fantastic service. The food and service was absolutely brilliant. Everyone commented on how good the food was. Thank you again for your high quality service. I have used Hammonds now on many occasions. The staff are always on time, professional and very friendly. The food is always served hot and of a very high standard. I was very impressed with the efficiency and friendliness of the staff, and the quality and quantity if the food. I would definitely use you again without hesitation. The Staff were Exemplary in every way,going beyond their duty delivering cake and drinks,collecting plates etc from all over the garden! And it is a big steep garden! You have a very well run business. Your team were excellent, we couldn't have asked for better. Their efficiency was amazing yet we didn't feel hurried in any way. The meat was cooked to perfection...apparently, I'm veggie! The numbers were just about right as the left overs disappeared before the evening finished, phew! Please extend our thanks to the whole team and especially Karen who really seems like a friend to the Johnson/ Jones households! Also to Sally who really organises me so well. So sorry for not getting back to you sooner. We have only just returned from honeymoon in Italy where we had a fantastic time. We just wanted to say how pleased we were with your catering services from the food to the bar. The food was absolutely first rate and very high quality. I have never known such polite, attentive staff and there have been many comments to that effect. Nothing was too much trouble for you and your team and the day and evening went just perfectly. Everyone has commented on the quality of the food both for the daytime and the evening and how organised your service was. We really appreciated the personal touch you gave and this goes for Darren and his bar services also. Your team are a credit to you. I know the day was a long one for you all but we do hope you enjoyed it also. We hope to have more parties in the future and will call on your services again....We've no doubt! With very best wishes and many, many thanks....! We would just like to thank Ann-Marie and the guys at Hammonds Catering for a fantastic BBQ which we held in our office garden. They arrived on time, set up very quickly with no fuss and the food was delicious and plenty of it. They very kindly left the extra food in foil dishes so we could enjoy it the next day so nothing went to waste. They packed up without us even noticing and left the garden clean and tidy. Would highly recommend them and I’m sure we will be using this fabulous service again. Both Pete and I have to say it was the best, most professional catering service we have ever had! Thank you so much to you and all of your team. Please pass our thanks onto all your staff! All of our wedding guests thoroughly enjoyed the food and we hear you will be getting many more bookings from our family and friends in the near and long term future. You were all amazing and the food was delicious! Hog Roasts and BBQ’s are very popular and always seem to hit the spot. Our amazing salad range is the perfect accompaniment. If you have a date in mind for your event, please check the date with us as soon as possible to avoid disappointment. There is no obligation at this stage!